PALMDALE – A 58-year-old woman died Tuesday night after crashing into oncoming traffic at a Palmdale intersection, investigators said. Jeanette Hansen was pronounced dead at Palmdale Regional Medical Center, according to the Los Angeles County Coroner’s office. The Palmdale resident died after she was involved in a three car collision, which occurred around 8:06 p.m. Tuesday near the intersection of Tierra Subida Avenue and Rayburn Road, according to Detective Brent Bunch of the Palmdale Sheriff’s Station. 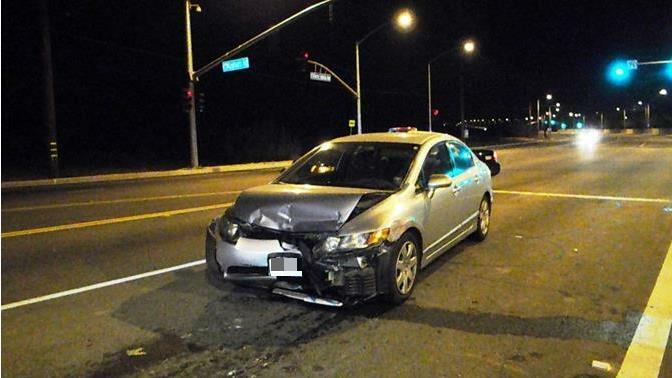 Hansen was driving a 2007 Honda Civic southbound on Tierra Subida, when she attempted to make a left turn eastbound onto Rayburn Avenue, Bunch stated. “During the turning movement she proceeded straight through the intersection into oncoming northbound traffic stopped at the red light,” Bunch stated. Hansen crashed into 2008 Nissan Altima driven by 44-year-old Merla Buckner, and then crashed head on into a 2011 Chevy Malibu driving by Luis Torres, Bunch stated. Hansen received medical aid at the scene, and then she was transported to Palmdale Regional Medical Center, where she was pronounced dead, Bunch stated. Hansen’s cause of death is being investigated by the Los Angeles County Coroner, according to Bunch. “We’re just checking all possibilities right now,” Bunch stated, adding that he could not say whether or not a medical condition may have caused the crash. There were no other injuries at the scene of the collision, Bunch said. Tierra Subida Avenue was closed to routine traffic between Pelona Vista Park Entrance and Rayburn Avenue until approximately 3 a.m. Wednesday while the incident was being investigated. 12 comments for "Woman dies after Palmdale traffic crash"
It was my sister’s car, Jeannette Hansen. We think she suffered a heart attack when she was making the turn. Thank you so much for the condolences. She was a great sister, mother, wife, aunt, and grandmother. It was so unexpected, so young. We thought she would be around for much longer. So take a lot of pictures, call, love, and hug the people you love as much as you can because we never know when our time or others will come. We thank God for the gift (my sister)that we enjoyed and loved to be around. Lisa, I am so sorry for your loss. She is sleeping with the angels now. God bless you and yours and may he give you strength to get through this difficult time. Very nicely written Lisa. ;condolences to you and your family. Doesn’t look like too serious and accident. Perhaps she was suffering a medical emergency that caused her to crash (heart attack, stroke). TheHeat– Clarify please, or you make no sense. He’s saying. .. That’s not her car. . Not that it matters. . It was an accident involving THREE cars so I’m sure it was ONE of the THREE. .SMH, a lady passed away and TheHeat is WORRIED about the picture of “A” car. .
How sad. My condolences to her family. So sorry for the family. Laura,I’m sad to hear of this, deeply sorry for your family’s loss.Your mother was a lovely woman with a beautiful spirit & an incredible smile she was always so kind&welcoming.I will be praying for you at this difficult time,you have my deepest heartfelt condolences.Be strong ~When you need to light the way,think of your Mother’s love and use it that day~ Angela F.